Cheaper Canadian lobster could hurt American exports over holidays. PORTLAND — A trade deal between Canada and the European Union could amount to a lump of coal for the U.S. at Christmastime. The Christmas season is typically a busy time of year for American seafood exporters, as the type of lobster that is native to North America is popular in some European countries around the holiday. But Canada and the EU brokered a deal this year that gets rid of tariffs on Canadian lobster exports to the 28-nation bloc. Canada, the world’s other major lobstering nation, is now at an economic advantage over the U.S. Members of the U.S. lobster industry, which is based in New England, said exports to Europe have been pretty typical this year, but they’re worried about the future. The new trade rules, called the Canada-European Union Comprehensive Economic and Trade Agreement Implementation Act, or CETA, cleared their final hurdle in May. The tariffs for fish and seafood had been averaging 11 percent, and the EU is the biggest importer of seafood in the world, importing nearly $300 million in American and Canadian lobster last year. The rules are taking effect as American lobster exports to some key European nations have tailed somewhat in recent years. Exports to France fell from more than $42 million in 2006 to less than $27 million in 2016. Spain’s imports dipped from $51.6 million to $42.6 million in that time, and business is also down slightly in Italy, another major importer. Canada’s lobster exports to the European Union, measured in Canadian dollars, grew from about $88 million in 2013 to more than $192 million last year, according to statistics provided by the Canadian government. The value of the Canadian dollar has slid to about 78 cents on the American dollar in that time. Meanwhile, lobster exports to Asia have exploded. 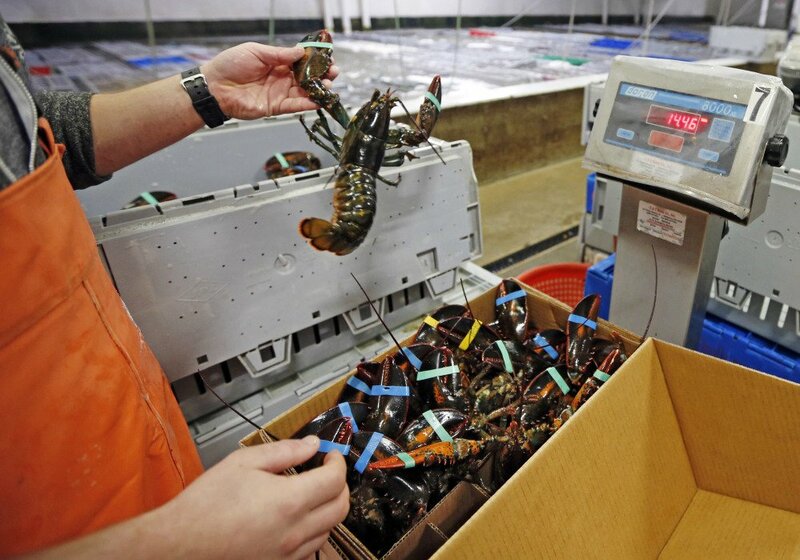 China imported less than $800,000 in U.S. lobsters in 2006 and took in more than $108 million last year. The trade rules could instead end up hurting American shippers during slower parts of the year, said Stephanie Nadeau, owner of The Lobster Company in Arundel, Maine. There might be enough demand to go around in busy times such as Christmas, but it could dry up during the slow season, she said. The U.S. has more than enough lobsters to send to Europe. The country’s lobster fleet, based mostly in Maine and Massachusetts, caught a record of 158.5 million pounds (71.9 million kilograms) of lobster in 2016. Some in the fishery suspect a lower figure in 2017, but statistics won’t be compiled until early next year. In Canada, members of the lobster industry cheer both the high catch volumes and the relaxed trade rules. A lot of U.S. lobsters get sent to Canada for processing and eventually find their way to Europe and beyond, said Jerry Amirault, president of the Lobster Processors Association of Nova Scotia and New Brunswick. “We have a very close relationship with U.S. landings,” he said.